NASA Earth Observatory images by Lauren Dauphin, using MODIS data from NASA EOSDIS/LANCE and GIBS/Worldview. Story by Kathryn Hansen. 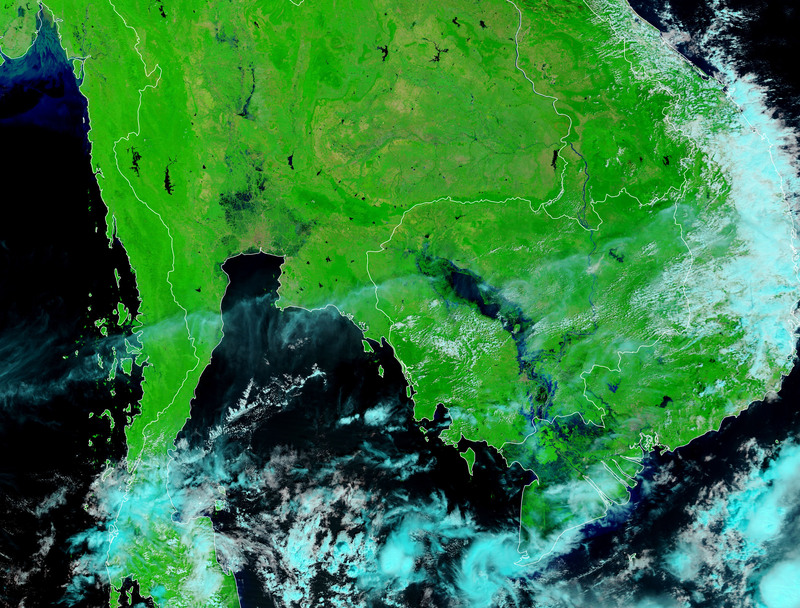 Seasonal monsoon rains have left parts of southeast Asia waterlogged. 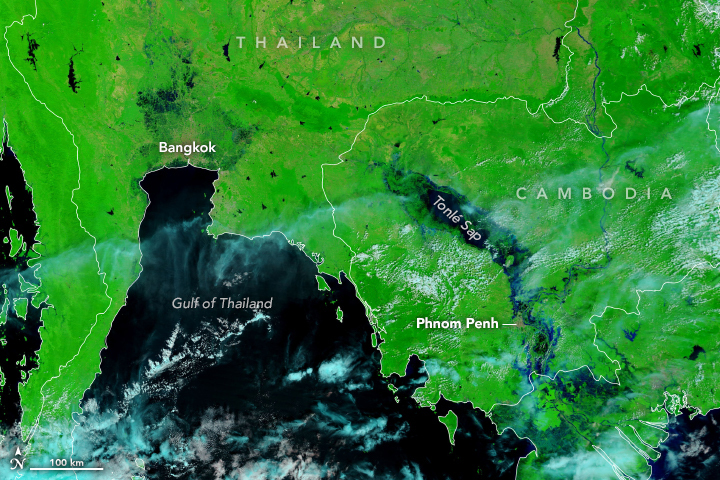 The right image shows conditions in Thailand and Cambodia on November 4, 2018, after water spilled over the banks of several rivers and lakes and filled surrounding floodplains. For comparison, the left image shows the same area on April 10, 2018, before the monsoon season began. Both false-color images were acquired with the Moderate Resolution Imaging Spectroradiometer (MODIS) on NASA’s Terra satellite. They were composed using a combination of infrared and visible light (MODIS bands 7-2-1), which makes it easier to spot flooded areas. Water is navy blue to black, vegetation is bright green, clouds are cyan, and bare ground is brown. In Cambodia, seasonal rains typically fill the Mekong River and spill across the flood plain, although some years bring more water than others. According to news reports, the 2018 rainy season across Cambodia has fluctuated between flood and drought conditions, affecting the region’s agriculture. Seasonal flooding is also important for the freshwater swamp southeast of Tonlé Sap�Cambodia’s “great lake”—and for the birds and mammals that depend on that habitat. In November 2018, the area was added to the list of Ramsar sites—wetland areas identified as having international importance. 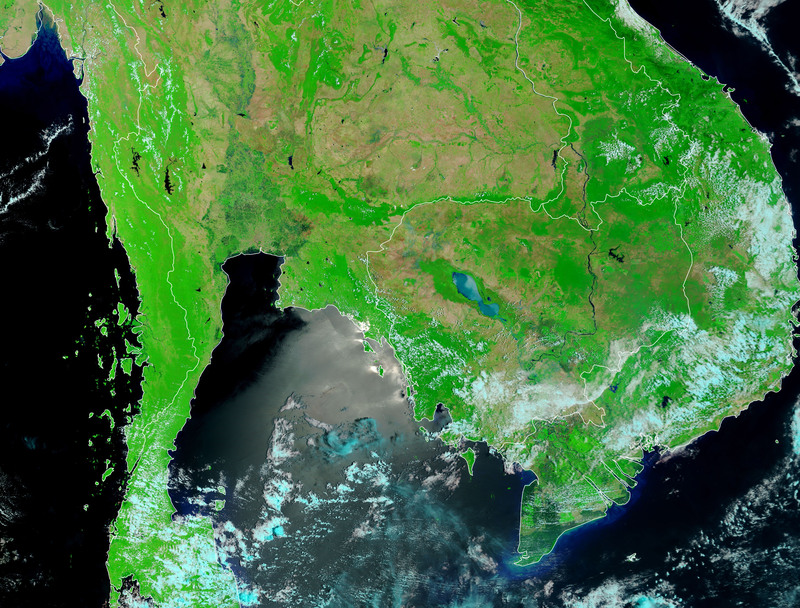 In Thailand, flooding is visible near Bangkok within the Chao Phraya River basin. Areas to the south, in Prachuap Khiri Khan and Chumphon provinces, saw deadly flash flooding after 20 centimeters (8 inches) of rain fell on November 9. 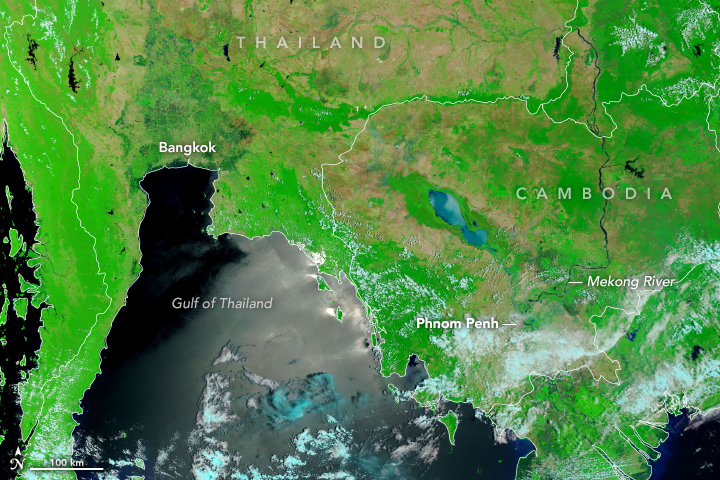 NASA Earth Observatory (2013, October) Floods in Southeast Asia. The Nation: Thailand Portal (2018, November 10) Flash floods kill 2 in provinces. Accessed November 14, 2018. The Phnom Penh Post (2018, November 12) Drought affects 13 provinces. Accessed November 14, 2018. The Phnom Penh Post (2018, November 8) Kampong Thom wetland picked as the latest Ramsar Site. Accessed November 14, 2018.